Aside from the usual triple A games and well-known franchises that appear on the market regularly, there’re always some games that try to be different. Sometimes they succeed and get praised into heaven, sometimes they get marked as ‘junk’ and thrown away like a pair of worn out socks (yes, with holes in it). 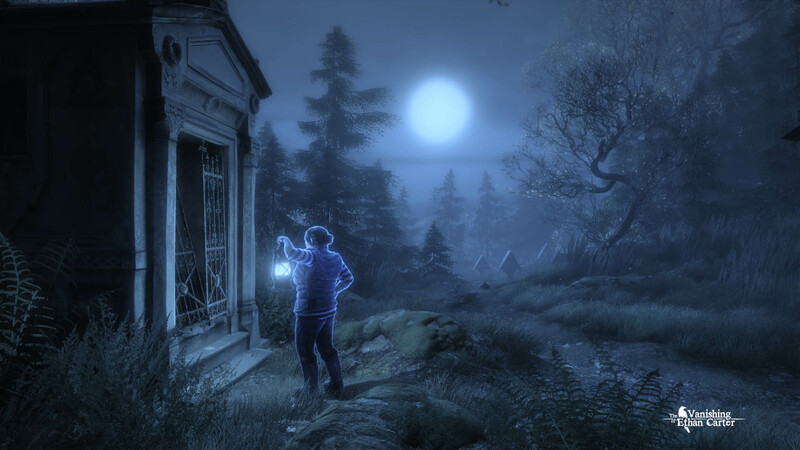 The Vanishing of Ethan Carter is one of those games that tries to be different as well… and fully succeeds in doing so in the best way possible. For the sake of getting the most joy out of this title, I’m going to limit the information on this section of the review for obvious reasons. 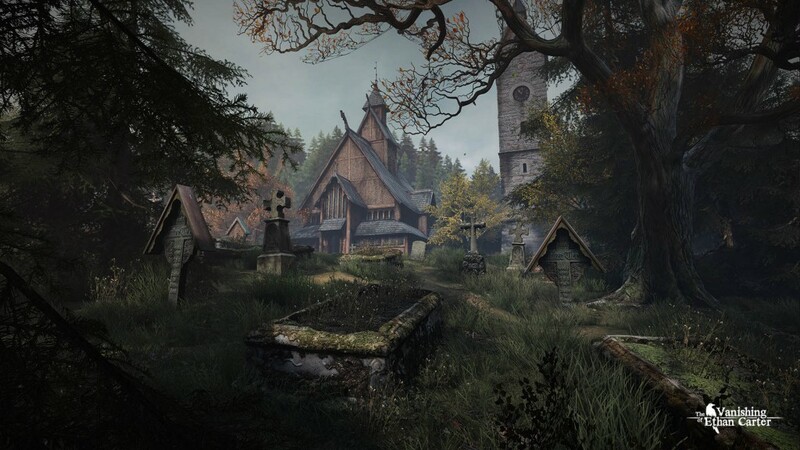 It is crucial, yes I repeat, crucial that you know as little as possible when playing The Vanishing of Ethan Carter. The experience will be a lot more special if you just jump in and explore the game on your own. The character you’ll be playing as is called Paul Prospero. He’s some kind of supernatural detective whose job it is to, well, find the rather mysterious kid Ethan Carter. Luckily, Mister Prospero possesses some extra-ordinary capabilities (like summoning visions from the past among others) which will help him greatly in his investigation. Nope, nope, I’m not going to tell you guys any more. If you’re dying to find out more about Ethan’s disappearance, then I strongly suggest you go ahead and buy the game. It will be worth it. 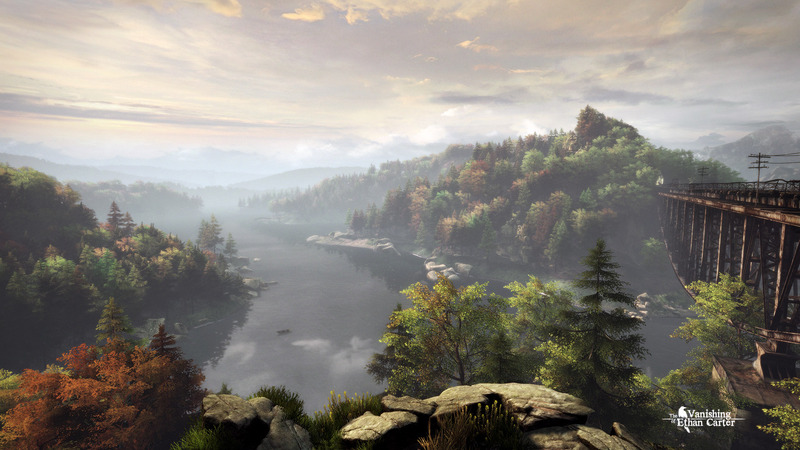 Simply put: The Vanishing of Ethan Carter looks absolutely gorgeous. It’s been quite a while since I’ve been so impressed with a game’s graphical power. From the moment the game drops you in the woods, you’ll be looking left and right, up and down, to see how beautiful the bushes, trees, and sky look. Everything is so incredibly detailed that it’s hard to believe this is just a video game. Be sure to check out the lake and the stones shimmering from under the water and the grass waving in the wind. This is as realistic as it gets. First of all, let me mention how awesome the voice of the character you’ll be playing as, Paul Prospero, sounds. Right of the bat, this sets the tone for the whole game. The other voice actors are a bit less overwhelming compared to Paul’s, which is a pity but of course, not everyone can have a Morgan Freeman-like voice, especially not a kid. The Vanishing of Ethan Carter has some eerie instrumental music playing in the background which only enforces the mysterious and dark atmosphere. Quite often, I felt pretty tensed when going inside a suspicious looking building and the music and overall sounds only enhanced that feeling which is great. Like the graphics, the sound design in this game surely deserves a thumbs-up. Expect to be dropped in the game without much of a tutorial or explanation. It’s entirely up to you to fend for yourself, which certainly has its charm. The game offers a simple and easy control scheme so having no real tutorial is not much of a problem. The moment a player receives control of the main character, they are free to wander anywhere they want. Apart from obvious restrictions (like water and cliffs), one can go exploring as much as he/she likes. It’s even recommended that you do just that as it’ll earn you some interesting discoveries. Most of the time, players will have to walk around and stumble upon objects and other things which will help in finding out what exactly happened over there. Sometimes, when you find something, you’ll have the option to ‘sense’ or ‘touch’ the object which will summon a part of a vision on screen. Alas, you must find all the relevant pieces of information before you can complete the vision and ‘activate’ it. There are a couple of puzzles hidden away in the game. Mostly they are not that difficult to solve although there’re some that might prove a bit of a challenge. In the occasion you get stuck on one of the puzzles, a walkthrough might be the way to go but be sure to see this as an absolute last resort. In the end, there are only two real downsides for this game. The one being that it’s pretty short. If you’re one who rushes through games (and may I advise that you seriously reconsider doing that for this game as it’ll greatly reduce the satisfaction for completing it) then you could complete the game in about 3-4 hours. Then again, for a game like this it shouldn’t matter much how long it is, it’s all about the experience you get for playing it. The other ‘downside’ (more like a technical issue) is the fact that the game suffers from occasional and very short loading stutters. While traveling the map, you won’t be confronted with any loading screens, which is great, but sometimes you’ll notice an abrupt standstill where the game has to load the area. Fiddling with the graphic options can decrease the regularity of these stutters, but they don’t always vanish (pun intended) completely. 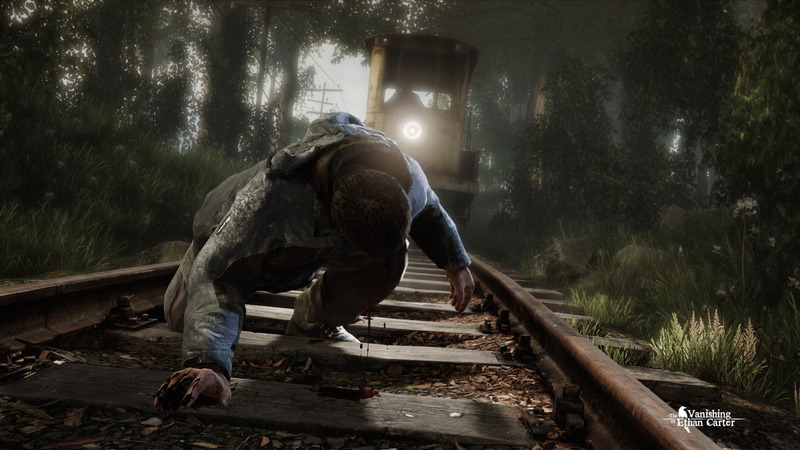 The Vanishing of Ethan Carter is one of those games to add to the ‘special’ category. Well, the good ‘special’ category that is without any doubt. If you want to experience an intriguing story where you aren’t guided in any way and where the world feels like it’s almost tangible, then please, stop researching information about this game (we will look the other way concerning this review), buy it and go find Ethan!